Perhaps unsurprisingly – given the low dividend payout association – another interesting note is the idea that Warren Buffett’s Berkshire Hathaway (BRK.A) announced a roughly 6% stake in this company about this time last year (May of 2013). Granted this half a billion dollar stake was likely the result of smaller portfolio managers Ted Weschler or Todd Combs doing – but it remains that Berkshire is a major shareholder in this company. Moreover, according to Berkshire’s February 2014 13-F, Berkshire Hathaway now owns 9.5 million shares or three-fourths of a billion dollars’ worth – roughly 8.9% of the Chicago Bridge & Iron Company’s outstanding shares. If Buffett hopped on board it wouldn’t be unimaginable that Chicago Bridge & Iron could become a Berkshire Hathaway subsidiary – Berkshire certainly has the cash. But of course that would be pure speculation – all we can say with any likelihood is that a “Todd” or “Ted” is probably fond of the company. 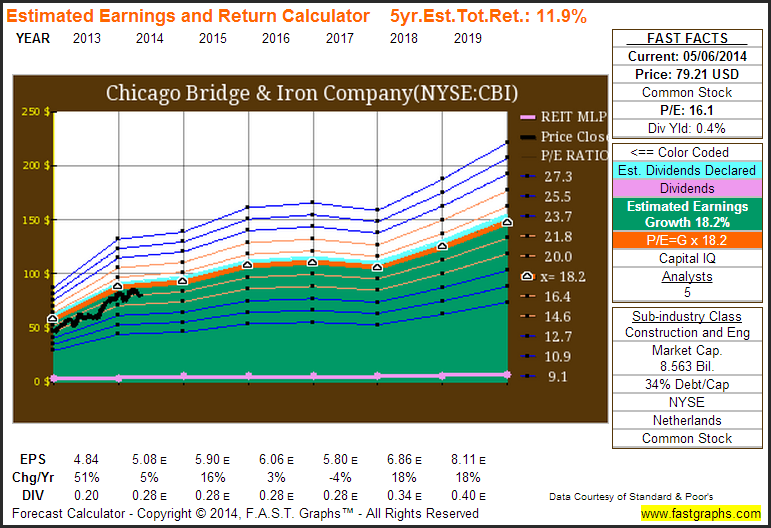 Below we can see that Chicago Bridge & Iron has been somewhat cyclical, but overall a very strong grower. Noticeably, the company has two negative years of earnings. However, despite these setbacks, Chicago Bridge & Iron has still been able to grow by about 16% a year since the turn of the century. Additionally, it is clear to see that the dividend (pink line) is very well covered by earnings (green area). Finally, we can easily see the causal relationship between price (black line) and earnings (orange line) – that is, good, bad or ugly, where earnings go price eventually follows. Luckily for Chicago Bridge & Iron shareholders this relationship has been largely positive over any long-term time frame. With regard to performance, it should be expected – given the above described relationship between price and earnings – that shareholders were rewarded right alongside with the business. In viewing the performance results table we can see that this was precisely the case – a hypothetical $10,000 at the end of 2000 would now be worth about $172,000. This represents a 24% annual growth rate as compared to just 4% yearly growth provided by the S&P 500. 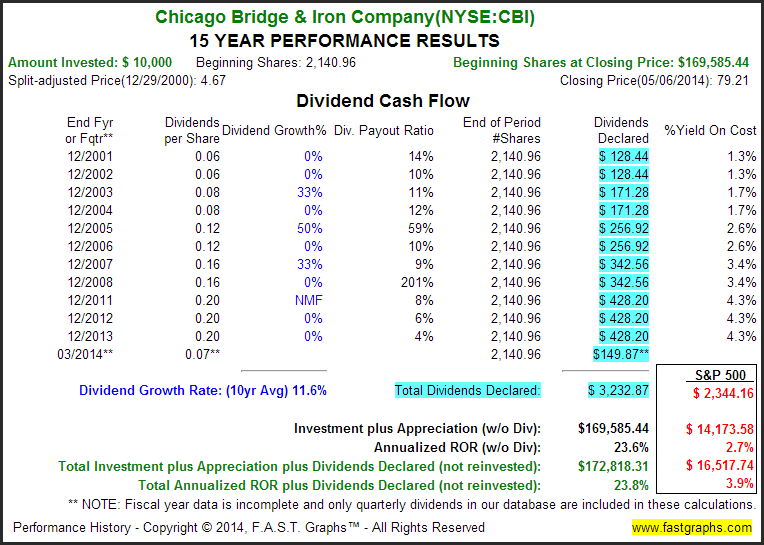 Moreover, despite the company’s low dividend yield and payout ratio, the Chicago Bridge & Iron investment would have also provided more dividend income than the S&P 500 index. 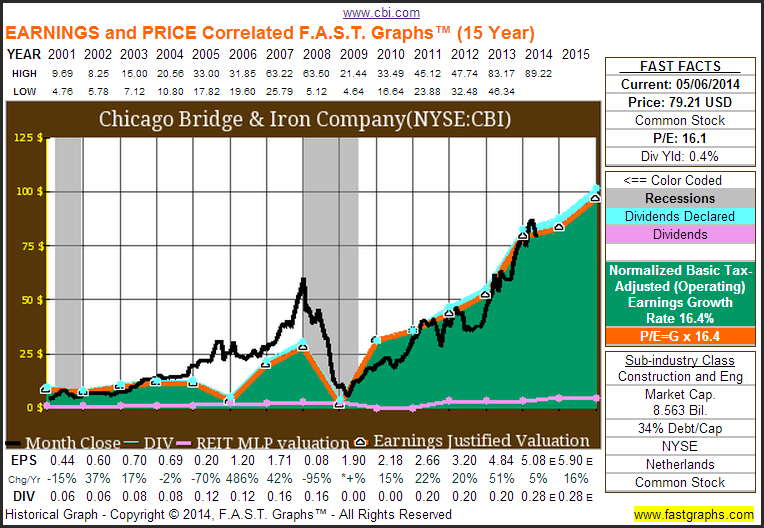 This entry was posted in FAST Graphs At-A-Glance and tagged BRKA, CBI, CVX. Bookmark the permalink.